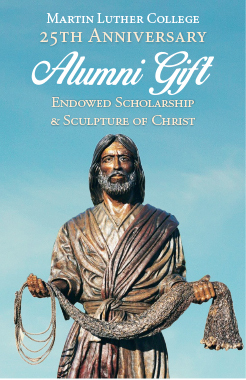 We are excited to share with you a NEW ALUMNI GIFT to celebrate the upcoming 25th anniversary of MLC during the 2019-2020 school year. THIS GIFT WILL . . .
Support MLC students with an endowed $30,000 MLCAA scholarship. 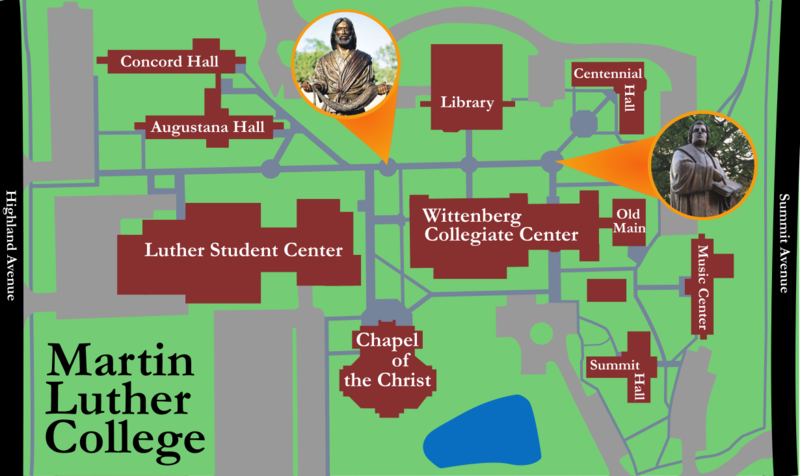 Erect a statue of Jesus Christ on the campus of Martin Luther College to provide a visual reminder of the motivation and call to serve in the public ministry for MLC students, faculty & staff, and alumni while reinforcing the mission of Martin Luther College. Establish and fund an endowed scholarship that supports and encourages young men and women who desire a Christian education in preparation for Gospel Ministry. Provide an opportunity to encourage and pray for gospel ministry. Raise the profile of MLC’s mission and encourage prospective students, MLC students & faculty, and alumni in the public ministry. Encourage members to participate in two-way communications around events and happenings at MLC and within the MLCAA. Provide an opportunity for MLC alumni to deepen their impact on scholarship and support for MLC. Establish an MLCAA endowed scholarship fund. The MLCAA is committed to deepening our impact on MLC financial aid. This endowed scholarship will create an avenue to support students for generations to come. It is to be awarded annually to MLC juniors and seniors studying for Gospel Ministry. “Fisher of Men” depicts Jesus Christ at the Sea of Galilee calling Andrew and Simon Peter to follow him and become fishers of men. Holding a cast net, a visual symbol of the call to ministry, Jesus awaits our response to the timeless question which all must answer. 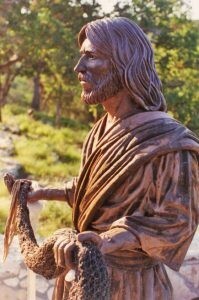 Christian artist Max Greiner, Jr. created the face of this statue as the result of prayer, referencing ancient depictions of Jesus. At MLC, the statue’s gaze will be directed at the cross atop the Chapel of the Christ—a visual reminder of Christ’s saving work. 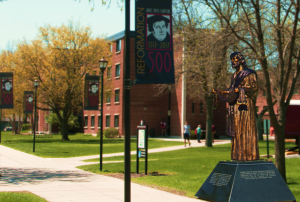 Greiner’s statues can be found on the campus of Wisconsin Lutheran College and other Christian colleges and universities around the United States. “Fisher of Men” is currently the only one of its kind in Minnesota and the surrounding states. The statue will be set at the center of the MLC mall on a base mirroring that of the campus’ Luther statue, with Bible passages on all sides. Symbolically, Luther will be looking down the mall towards Christ, as he points to the Bible in his hand. Further symbolism comes into play as MLC graduates and faculty traditionally pass this location in procession at the start of graduation ceremonies. As a focal point on campus, “Fisher of Men” will reinforce MLC’s Christocentric mission and world view to visitors, families, and potential students. It will inspire and encourage MLC students, faculty, and staff, and remind one and all to pray for called workers and the gospel ministry. 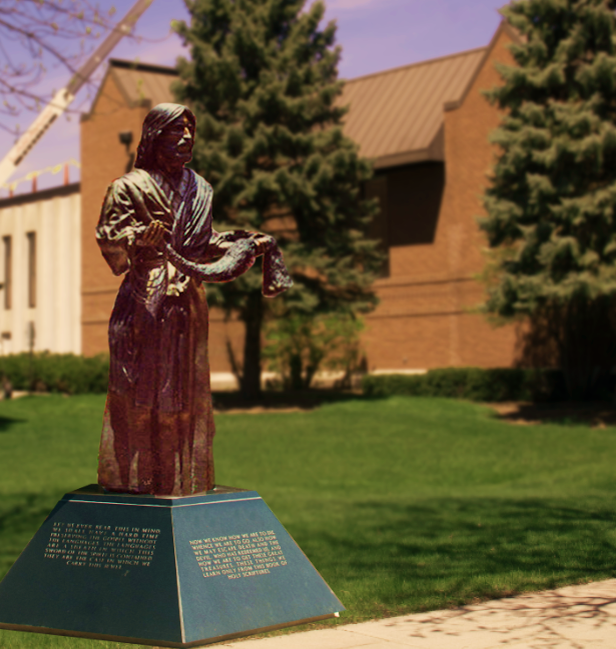 The statue will serve as a visual reminder that Christ is at the center of Martin Luther College. Its waiting pose serves as motivation to answer Christ’s call to be fishers of people. 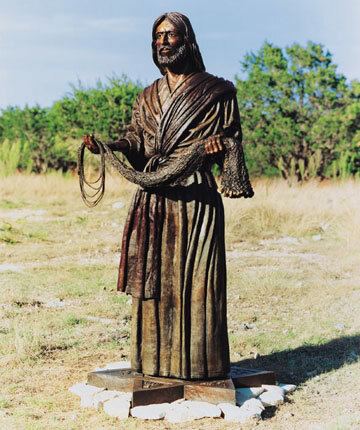 The statue’s Bible passage-encircled granite base reinforces the message that workers in Christ’s kingdom are called to use God’s Word to bring people to Jesus. The MLCAA scholarship will offer ongoing support to the men and women who answer the call. Depiction of the statue in its setting on campus provided by the MLC Art In Ministry club. The current funding structure has 100% of every gift going to scholarships and projects; 70% of every dollar given is dedicated to projects and 30% of every dollar goes toward scholarships. This is a unique feature of a gift to the MLCAA. 100% of every gift goes toward Martin Luther College and it’s students. Other alumni associations often have a percentage of the gift go toward administrative costs. We are thankful to Jesus for this ability. Fall 2017 to Fall 2019—receive gifts, donations, and contributions to the 25th anniversary Alumni Gift project. 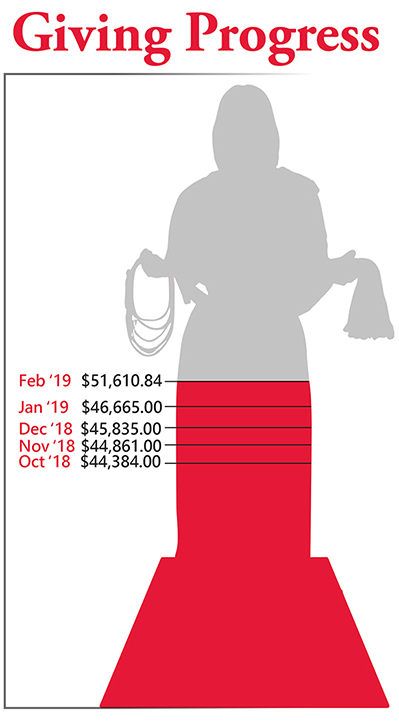 Fall 2019 to Summer 2020—erect “Fisher of Men” statue on the MLC campus. 2020-2021 school year—award the first MLCAA Scholarship. Call the alumni office during business hours at 354.1995 x387. Who are we? The Martin Luther College Alumni Association’s purpose is to strengthen relationships between Martin Luther College (MLC) and its alumni, providing opportunities for alumni to serve their college, and for the college to serve its alumni.